I am thrilled to have my dear friend and guest, the lovely and talented Ann, from Anncoo Journal with us today. Ann blogs out of the beautiful city state of Singapore where she lives with her hubby and two sweet pets, Cookie and Dodo. I had the privilege of meeting Ann during my last visit to the region and we continue to keep in contact via email. You can read about our meeting here. I am honored and flattered to be invited to do a guest post at Biren’s site, Roti n Rice. I have no idea what to make for my dear friend as Biren is a very talented cook and her food always makes me drool especially her Asian food. So when I asked Biren what she wants me to do for the guest post, she said she would like me to make a dessert for her. As the Korean strawberries are in season now and you can easily find them in the market, I decided to make a healthy dessert with strawberries. According to Flame communications, over 350 tons of Korean strawberries were imported to Singapore in previous years. Korean strawberries are very sweet and juicy and they are high of vitamin C and anti-oxidants are a big draw to Singaporeans. So here is the beautiful and healthy dessert ~ Strawberry Sunburst with Almond Cream that using soya milk instead of full cream milk. To prepare the almond cream, I also added some Amaretto liqueur for a richer flavor. The almond cream can be prepared a day or two ahead, stored in the refrigerator and assemble the strawberries on the cream before your guests arrive. Thank you Ann, for taking the time to share this lovely recipe with us. This would make a very impressive dessert when there is company. 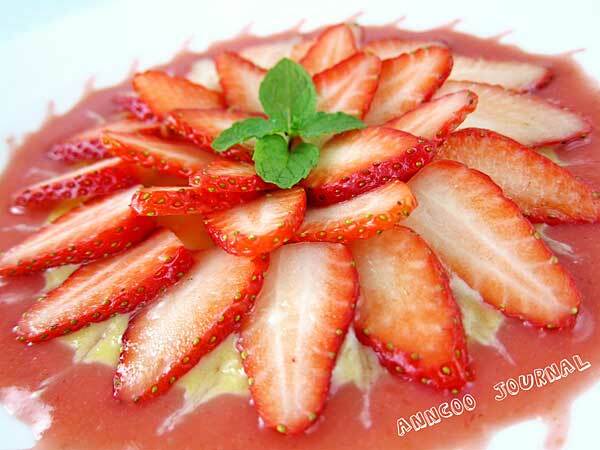 I can’t wait for strawberries to come in season again so that I can try out your wonderful creation. You’re welcome Biren 🙂 Thank you very much for the invitation. So glad you like this post and hope that your readers enjoy this post too. Ann IS a master baker – always and inspiration and this combo is gorgeous. It’s great that you guys got to meet up. A very pretty strawberry sunburst! Wow this looks amazing! Those strawberries look so fresh and delicious… Awesome presentation. this dessert would be welcome at my table any time! This is simply gorgeous, Ann! I love your addition of the Amaretto liqueur. At first glance this looked complicated to make, but I’m glad it’s not as complicated as it looks. Thank you Biren and Ann for sharing. I’m big fan of Ann’s blog too. This dessert is so lovely bursting lots of colors and the almond cream is such a delicious idea. Love Ann guest post! A nice dessert to fight off the heat! Hi Clare! Thanks for visiting. Yes, Ann is very talented. I wish I could bake have as well as her. This dessert is gorgeous! That’s great that you got to meet Ann…she is fabulous! And this dish sounds amazing!! 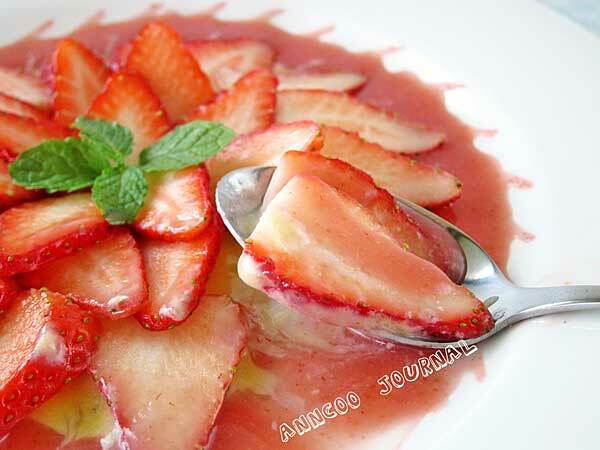 I’ve had almond cream before, but not with strawberries, looking so pretty like this! How pretty! It will be a great centerpiece. Oh it’s sooooooo beautiful!!! I wouldn’t want to eat it it’s so beautiful…but I would! 🙂 Just stopped by to say thanks for your sweet words of support about my little 2 year old jailbird Cooper. Sorry it took me so long to get back to you for commenting on that post…It’s been a bit of wild ride around here. Thank you again and I’ll talk to you soon. 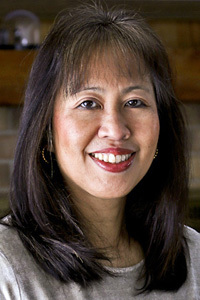 hi biren & ann, just came over from ann’s blog. This dessert looks impressive! hough it doesnt sound too difficultto make, i’m very sure this will make great presentation on the dining table. I just went back and read on the singapore trip, it’s been 20 years since my last trip there but i agree that there’s so much food, endless shopping and always new discoveries! have a great weekend! This looks TOO good! Love strawberries. I’ve always loved raspberry coulis but never had strawberry. I bet it’s delicious! What a great healthy snack! I could eat the WHOLE plate :D. Thanks Ann for the post and Biren for sharing it! 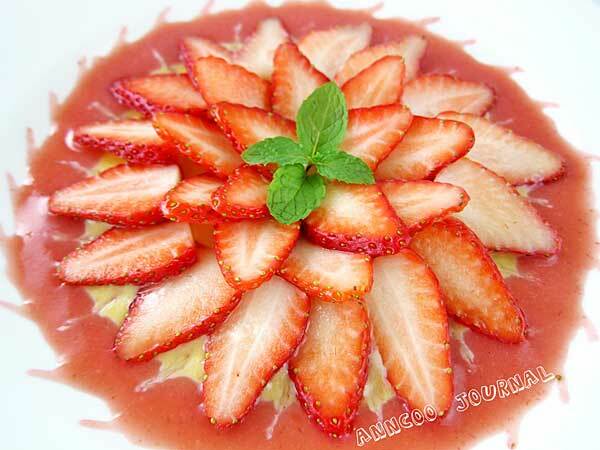 The strawberry sunburst dessert looks pretty! I can imagine how much fun it would be to eat this delightful dessert. Great recipe, Ann! Have a lovely weekend, ladies! Thanks for introducing us to Ann. What a gorgeous looking dessert and love all of her dessert titles. Sunburst on the strawberries is just brilliant. Must check out Ann’s blog, too. Thanks for sharing such a beautiful dessert Ann – almonds and soy milk are two of my favourite ingredients and the presentation is just gorgeous! I usually eat strawberries fridge cold, just as they are but it’s worth taking a little time to do a lovely dessert like this! That is so gorgeous Ann…fantastic guest post! Now I wish I were not allergic to strawberries, they are just so pretty.